This was not my first visit to Outrigger Fiji Beach Resort but it is becoming one of my favourite places to stay. They have a philosophy that revolves around supporting the local community which strongly appeals to me so combine that with a comfortable place to stay and good food and I am extremely happy. The Outrigger Fiji Beach Resort is just over an hour’s drive from Nadi airport along the Coral Coast – drive through Sigatoka township, cross the Sigatoka River then another 10mins on turn off the Queens Highway and you will soon be hearing the enthusiastic BULA that greets everyone as they are driven through the entrance. The main part of the resort is nestled between the road and the white sand lagoon-beach with the sparkling turquoise waters of the Coral Coast gently lapping the shoreline. Outriggers design is reminiscent of a large Fijian village. This is a hotel that will suit everyone, whether you are enjoying a break on your own, a romantic getaway with your partner or a family with young children. Whatever style of holiday you desire, they can cater for it. If you are travelling with young children this is a great place to stay as they have a fantastic kids’ club. Every time I passed I heard children’s laughter ringing out and there were always plenty of activities going on. Plus, they have one of the best Nanny services around. The complex is set among 16 hectares of tropical gardens that flow down to the lagoon. There are hotel style rooms and bures. Over to you as to what you prefer but they are all comfortable and they will soon be even more stunning as a refurbishment is in the design and planning stage. Families are well catered for with family-friendly areas and for those adults who want to be assured of peace and quiet, there are several adult only areas as well. This visit I stayed in a bure. Mine looked out onto the tropical gardens and was very private. If you want to be closer to the lagoon there are beachfront bures as well. With warm breezes and brilliant blue sky, the hammock chair hanging outside was constantly inviting me to lie back and relax. The traditional high thatched roof has a tapa lined ceiling and a comfortable interior. One of the added touches that I have enjoyed on each visit is the Talai butler service for guests staying in bures, deluxe ocean view rooms and suites. There was something special arriving back at my room each night to find a canape and liqueur (a different one each night) sitting waiting for me and encouraging me to sit down and relax for a few minutes after each event filled day. They also serve a glass of sparkling wine and canapes each afternoon between 5-6pm – a pleasant way to start the evening. I had taken an afternoon flight which meant I arrived at the resort in time for a cocktail before dinner and the aptly named Sundowner Bar and Grill bar is the perfect place to be in the evening. Set on the beachfront overlooking the sea gently lapping the shore below you have a great view along the beach, and more often than not, a beautiful sunset to watch. You know, one of those ‘Ahh’ moments as the sun sinks toward the horizon and the vibrant array of colours take over the sky for a few breathtaking minutes. What made it even better was having an exotic cocktail in hand and some tasty nibbles in front of me. Not only is the Sundowner Bar and Grill a good spot for a drink the meals from the grill menu are very tasty. They also serve lunch with pizzas from a wood-fired oven a speciality. If your preference is for a very relaxed meal then Vale Ni Kana is the place to go. Set in the heart of the resort this is like a huge bure and is the place for the vast buffet breakfasts or weekly themed buffet dinners. Baravi Restaurant is open air and located beside the pool making it a perfect place for a tasty Asian inspired unch or dinner. For a dining experience that you will be describing to friends when you get home try the awardwinning Ivi Restaurant – named after the old Ivi Tree that towers over the restaurant. This fine-dining, adults only restaurant is stunning with several of the dishes prepared for you at the table. Another place for drinks is the Vakavanua Lounge. They do some speciality cocktails after dinner and have live music each night. If you want a coffee or something quick to eat then Takai on the go in the lobby area is the place to try with views over the resort. Then there are the adult friendly areas. Kalokalo Bar is across the road from the main part of the resort and is perched up high on Vakalomalagi Hill with vast views up and down the coast, perfect for a romantic cocktail or two. For a quiet breakfast or casual lunch then Vahavu Bistro is just he place. Stay on after your meal and enjoy the peace of the swimming pool which boasts a swim up bar. Vahavu means ‘to relax’ making this the perfect place to while away an afternoon. This is where Outrigger stands out from other resorts. All of the projects that Outrigger is involved with in assisting the local community could easily be a story on its own but there is one project that is open for guests to join in. Outriggers direct-action Community Tourism Project with Conua Primary School in the Sigatoka Valley has reaped rewards for the everyone. While at the school you have the opportunity to help on the current project that is underway under the direction of the resorts engineers. On my first visit in 2016, I helped with the construction of the kindergarten. Last year I attended the opening of two new classrooms and the digging of the first sod for the new staff quarters that will be built during 2018. As well as these, over the last seven years, Outrigger Fiji Beach Resort has also built a large meeting bure that also serves the local village families as a safe shelter during cyclones, a new library and a computer lab. On this paid half day excursion as well as helping with the project, you get to meet and interact with the children at the school, enjoy a casual packed lunch and a visit to the culturally significant Tayuni Hill Fort. Of course, there are the usual resort activities with a popular Kids club, a variety of water activities, fitness centre, tennis courts and two swimming pools. The daily activities program caters for everyone. If you want a souvenir or two to take home there are several shops and craft stalls where you will have no problem finding something. If you want to work on your golf skills while on holiday and not go to a golf course, the resort has a Golf Training Facility. The facility has a 230-meter driving range, putting green, chipping and bunker practice area so there is no excuse when you play your first game after getting home to say that you’re out of practice. For me the must visit is the Bebe Spa, a short buggy ride across the road and up the steep winding road to where it is nestled high on the hill with the Kalokalo Bar. The treatments are as good as the views out over the Pacific Ocean and are one for a Spa bucket list. Bebe (pronounced Ben-be) is Fijian for butterfly and the idea is that once you arrive the spa is your sanctuary, or cacoon, so that after your treatment you emerge refreshed and rejuvenated like a beautiful butterfly. Everyone I talk to who has visited the Spa has their own favourite treatment so I won’t even try to suggest one – suffice to say I had trouble choosing as I poured over the menu repeatedly before finally making my decision. I was not disappointed and did make a note to myself that next time I would have a late afternoon treatment and then walk upstairs to the Kalokalo Bar for some bubbles and watch the sunset – the perfect way to finish a spa treatment. Outside of the resort, there are numerous activities that you can book. The closest, Kula Wild Adventure Park is just behind the Golf Training Facility. You could easily spend a whole day here and not get bored. There’s the animal interaction where you can get up close and personal with some of the fauna – an iguana unexpectedly jumped onto me having decided that for some reason it preferred being on me rather than in the knowledgeable hands of the ranger. Families with children will enjoy the water slide and kids splash pool where they can cool down. The coral aquarium lets you see the underwater world without getting wet and then for a bit of adventure there is the Canopy flier. This zip rail takes you from the canopy, then twists and turns around the trees down through the forest to the river bed and valley floor below. ECO-TRAX Fiji is a new and fun activity for everyone. Modified battery-powered bicycles have been mounted in pairs on specially designed frames with room for your camera and swimsuit. You get to ride along the old sugar can railway either under your own pedal power or relax and use the battery power option. It is safe and suitable for the whole family. You will pass through a cool bush, go over streams, pass through local villages and end at a private beach where you get to enjoy a swim and have a drink and fresh fruit. This would be one of the activities I have enjoyed the most on my many trips to Fiji over the years. 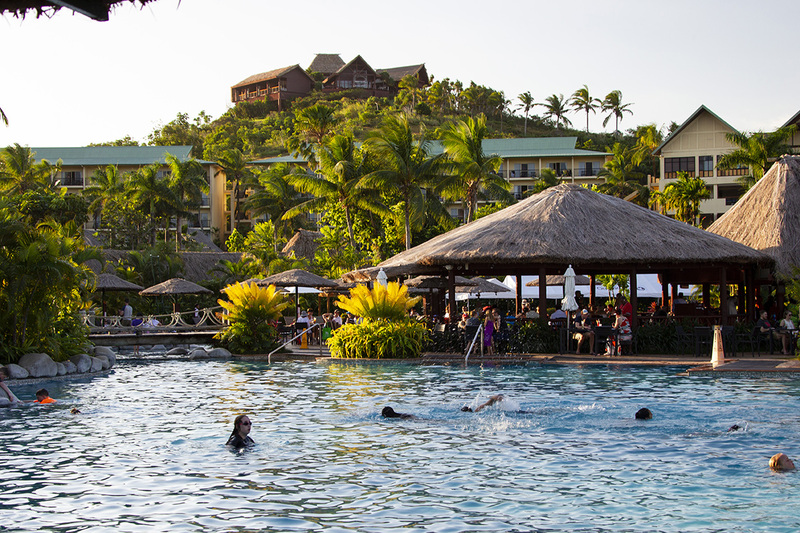 As I write this a couple of months after my trip it’s raining outside I’m thinking about how and when I can organise my next holiday in Fiji so that I can return to Outrigger Fiji Beach Resort. This place has everything that I want in a resort and more – plus my mind keeps picturing that hammock swing chair outside my bure and how I would love to be curled up in it with a warm Fiji breeze wafting over me as I take in a spectacular sunset. 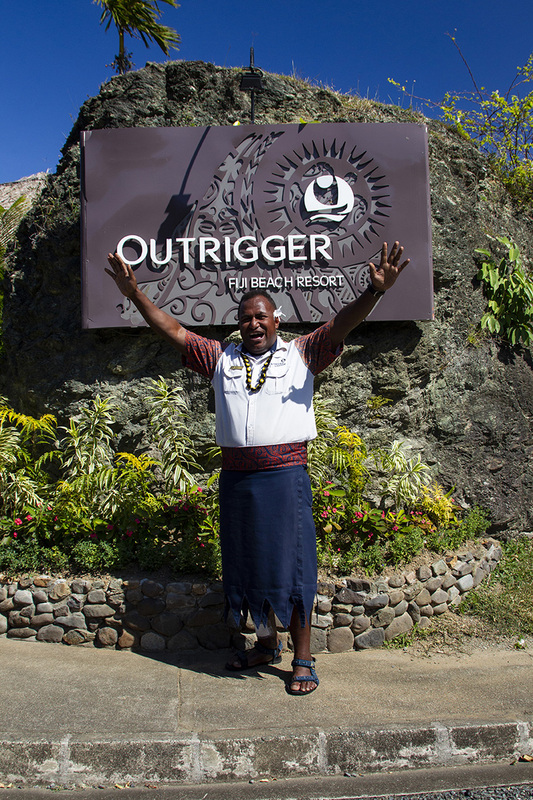 Elizabeth’s trip was courtesy of Outrigger Fiji Beach Resort.